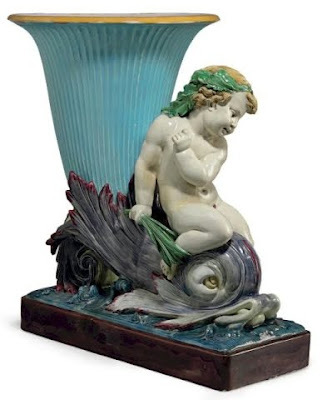 The April 20, 2010 auction teaser image is of a Minton majolica figure. It part of a nice group of majolica and palissyware. The figure is documented to be part of the 1862 London exposition but Christies has a black and white of the Minton stand at the 1862 show as documentation. The auction catalogue should be out by mid March.